Every Friday the 13th, thousands of motorcycles descend on the small town of Port Dover on Lake Erie. On a nice summer's day, attendance can reach +100,000. I've never been. But, I have seen news reports of the event and heard from others who have been. This year there will be only one Friday the 13th - in May. It all started in 1981 when a few friends got together at the suggestion of biker Chris Simon. They had such a good time they decided to meet up on the next Friday the 13th, and the next ... and a tradition was born. 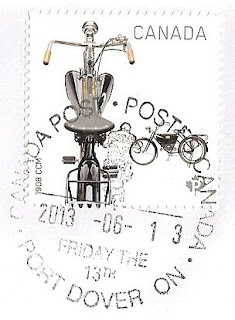 As for this stamp, issued in 2013, it shows a unique view of a 1908 CCM. It was designed by Mark Warburton with illustration by Mark Pilon. The Light Weight Motor Cycle had a Swiss designed engine that could be installed on any conventional bike frame, which made maintenance simple. It was billed as a "Gentleman's Motor Cycle" and was said to have no noise or vibrations. That is one wimpy motorcycle lol. I know, isn't it? In fact, when they first came out, I didn't realize it was a motorcycle! I like the unusual perspective of the picture. At first sight I thought it a bicycle, too! I love the perspective, it's a beautiful stamp! I have been on a motorbike, but I would rather have been the driver than hanging onto the driver and seeing only his back! Great story, stamp and postmark. And thanks to Eva for the suggested theme. The stamp invites you to throw a leg over and motor off. I love old motorcycles. I'd probably have second thoughts about a Friday 13th ride but then I'm not a devil may care biker which coincidently is a name connected to where hundreds of bikers gather each weekend near me at Devil's Bridge.